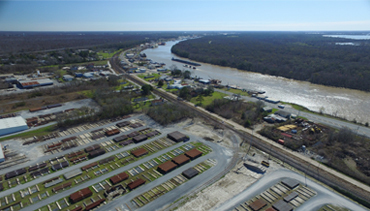 Patterson Tubular Services (PTS), Morgan City, has direct access to the Gulf of Mexico with more than 700 linear feet of bulkhead dock space available off the Intracoastal Canal (Avoca Island Cutoff). Likewise, PTS Channelview has more than 1,700 linear feet of bulkhead dock space available off Carpenters Bayou (Houston Ship Channel). Large-capacity cranes are available to safely load and offload cargo from barges, marine vessels, and a wide variety of other offshore and inland vessels. Ample dock space is available for staging materials, dispatch trailers, and parking. PTS Morgan City has a rail spur directly into the facility, and PTS Channelview offers access to team track deliveries locally. We use Pettibone-style forklifts with clamps or cranes to load and offload gondola and flat railcars. For material handling in our yards, we use heavy-duty Taylor forklifts with safety clamps to securely move tubulars. With approximately 192 acres at PTS Channelview and 92 acres at PTS Morgan City, we use our tubular data system (TDSW) to manage customer inventory, job orders, material movement, and billing. TDSW’s web-based application provides customers with real-time access to their inventory, shipping and receiving reports, and the ability to query historical inventory reports. at a fair, competitive rate while maintaining a leadership role in areas of employee and environmental safety"